Pneumatics was originated in the first century by Greek mathematician who invented instruments that are powered by steam or wind. It is a branch of engineering that uses gas or pressurized air and are used mostly in industrial sectors. To an extent, it works in the principle of hydraulics. It is the study of air and other gases which are especially under pressure whether be in rest or motion. Pneumatics is also a branch of physics that generally deals with gases and its mechanical properties. Otto von Guericke, a German physicist, invented a vacuum pump which can pull out air or gas from the vessel attached to it. Pneumatics has developed from small handheld mechanism to large machines that have multiple parts which provide various purposes. Hydraulics and pneumatics, both is the appliance which use fluid power. Pneumatics works with the help of pressurized gas or steam while hydraulics use liquids that cannot be compressed like oil. 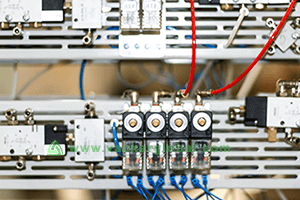 Mechanisms of pneumatics are designed simply and are easy to control with an on –off device. Pneumatics is reliable in nature. They function for a longer period of time and the maintenance required is very low. As the pneumatics use gases which are easily compressible, the tools and device have fewer chances of shock damage. Pneumatics generally doesn’t use fire as compared to hydraulics and are safe to use. As the supply of compressed air can be sustained by using atmospheric air, pneumatic systems are reliable to be used in factories. Mainly, nitrogen gas n used in a high ratio compared to other gases in pneumatic system. The gas used by this system is generally the gas found in the atmosphere like nitrogen, oxygen, oxygen-free nitrogen, soda steam, carbon dioxide etc., so the chances of poisonous gas leakage are very low and are safe to operate. It uses a small quantity of oil just to prevent corrosion and lubrication. Manageable pneumatic tools are generally powered by compressed carbon dioxide as it is easily available in the atmosphere. In the pneumatic system, air is an important source of operation. So it has endless access of the source. The changes of explosion, fire, and short circuit are comparatively zero. Because of this pneumatic system is safe and easy to handle. We do not need chemicals and other harmful stuff to clean air and the machine. So it is reliable to use pneumatic devices in food and beverage industries, textiles and pharmaceutical firms too. As compressed air is used in the devices, it is easy to use in any temperature as per the need of the installed device. The main source of power of pneumatic devices is air. So the power can be easily transferred and the speed can also be adjusted or easily set up. Compressed air has to be according to the need of the item such as dry, clean, and must be full of lubricants. So for this process, installation of air-producing equipment necessary which makes it costly. It makes a lot of noise because the produced air needs to be thrown out. The air that is thrown comes out very loud. As compressed air easily condenses, before using it needs to be processed for meeting the requirements like dry and clean air etc. Pressurized air occupies empty space and is hard to maintain as it has high chances of leakage. To fix this, leakage needs to be sealed and for not facing such problems pneumatics should have airtight equipment. 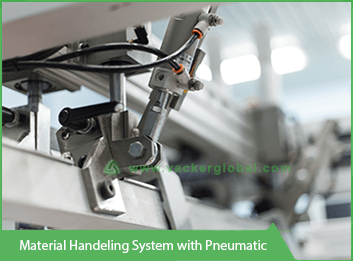 Pneumatic is a control method which is reliable for industries and factories. New and modified pneumatic systems are smaller in size with low cost, having more powerful features and greater precision. Vacker KSA is a very trustworthy in supplying the required type of pneumatic devices to make work easy in Dammam, Riyadh, Al Khobar, Jeddah, etc. We supply 100% efficient products to our valuable customers. Pneumatic systems and components are of different types and are used in various fields according to the need of the user. Some components are used in dentistry to do the dental drilling. Air engines are also provided by Vacker KSA which is used for pneumatically powered vehicles. The brakes that are used in train known as air brakes are also a type of pneumatic devices. Whether be an electronic pipe organ or tubular organ, booth are pneumatic components which use compressed air to operate. Jackhammers used in the construction of road, motor, cylinder and bladder that use compressed air, all fall under pneumatic components. 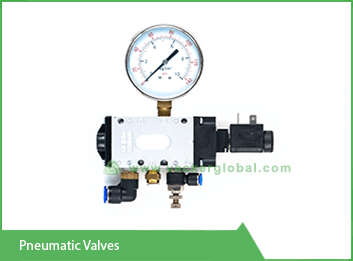 Pressure regulator, pressure switch, vacuum pump are some examples of pneumatic devices.